It’s time for another hearty vegetable salad, although if you want this one last long enough to have for lunch the next day you had better at least double the recipe. It’s that good, and beautiful to boot. Raw kale salads are run-of-the-mill these days, but this salad hails from an era when even people like us were a little skeptical about eating raw kale. It is a “massaged” kale salad that appears to have been all over the internet in 2009 with earnest promises that massaging the kale with salt would break down the cell wells and render it so tender as to be virtually cooked. Somehow, however, this precise salad didn’t come to my attention until today, when my friend sang its praises and urgently requested the recipe from his sister via text message. Thank goodness. And now I’m sharing it with you in case it also escaped your notice in 2009. As far as I can tell, this recipe is originally from Feeding the Whole Family by Cynthia Lair, and she got it from a colleague of hers at Bastyr University. If you want a demo of the technique, you can watch her video here, but it’s pretty basic: add salt to kale ribbons and gently knead and squeeze it in for a couple minutes, then add a ton of other delicious stuff, too. 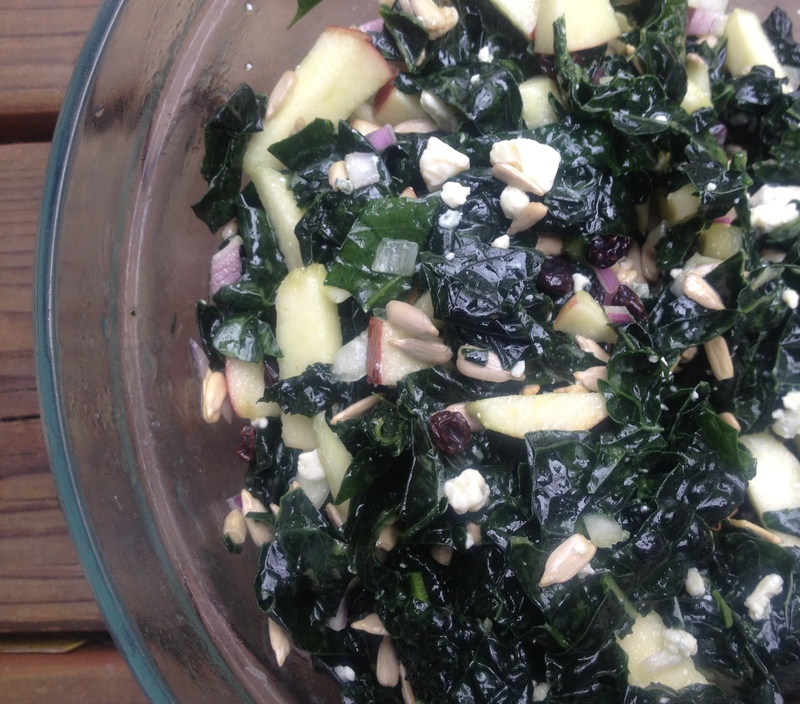 Kale Salad with Apples, Currants, and Gorgonzola: Slice a large bunch of de-stemmed kale (any kind) into ribbons and massage with 1 tsp. salt for 2 minutes. If the kale releases any significant amount of liquid, drain it off before continuing. Toss kale with 2 Tbsp. apple cider vinegar and 2-4 Tbsp. olive oil, then toss again with a diced sweet apple, a couple handfuls each of dried currants and toasted sunflower seeds, about ¼ c. finely diced red onion, and a few good crumbles of Gorgonzola cheese. Variations recommended by Ms. Lair: raisins or golden raisins in place of currants, pear instead of apple, and varying the blue cheese. This entry was posted in My Favorite Recipes, Salads, Vegetables By Themselves and tagged cheese, cooking, dinner, DIY, family, food, homemade, kale, kids, lifestyle, recipes, salad, vegetarian on April 20, 2012 by emmycooks. Definitely going to try this one, but not sure if I can still get fresh kale this time of the year. I’ve just made this salad in the RV in an RV park in West Yellowstone, MT. It was great, Kees liked it too. I’ll have to try it with kale back home as soon as it is available to see if that is the same. Haven’t tried the “massaging” technique on kale, though I have chuckled a few times before when hearing the term ;-). Looks lovely. It’s that time of year, eh? I just posted a raw kale salad as well. :-) Delish. Massaged kale salads are awesome! I think another great thing about them is you can prepare them in advance and free yourself up to doing other things in the kitchen. This is another yummy-looking salad, Emmy! Yes! The recipe says that the salad improves with age, but I honestly can’t say I’ve managed to test that out. I’m making it again today, so I’ll try to save at least a little…. I have that problem too . . . because I end up eating it before I can let it sit! I’ve heard of massaging kale but haven’t given it a try yet. I just got my inspiration! I’ll probably substitute feta for the gorgonzola, though – blue cheese isn’t popular chez moi! I think this would be great with feta, or ricotta salata, or even a creamy goat cheese. Or tiny cubes of Parmesan, for that matter! Oh, the options…. I always like when I come across a good-looking recipe and have all the ingredients on hand! I hope you like it if you try it! I did miss this in 2009, so thank you :) Sounds and looks delicious! That’s a great idea, and even less work! I made this tonight. It was so good! : ) Thanks for sharing!! Isn’t that great? I have made it many, many times since discovering the recipe!